There is a timeless quality to a quietly flowing stream. It encapsulates time in one free-flowing moment – the continuously flowing water has the past, the present, and the future all subsumed into one perpetual motion. This also true for our lives where the overlap of the past, the present and the future is an everyday occurrence. One seldom sees this seamless continuity in any narrative piece. Loren Edizel’s Adrift (Tsar) is like that stream – it doesn’t categorises life in to distinct compartments of the earlier, the now and the then. It weaves the stories of the characters in the novel in an uneven, overlapping, non-linear and multidimensional narrative that is at once breathtaking and profound. The novel is about John, who is a new immigrant in Montreal, working the graveyard shift in a hospital. He seems mysterious because he aloof and alone. In reality he is like anyone else who is new to Canada and has done a night shift survival job. In the bitterly cold nights, when one battles to stay awake, imagination can be a dangerous thing – it’s better to make it work for you can work (as John does) rather than letting it harm you. Also, one prefers to keep the baggage of the past to oneself, and avoids small chatter about the past one has left behind. You come to a new land to restart your life, not to re-live your past. In so many different ways, the novel redefines loneliness – no man (woman) is ever lonely in the mind – every moment in one’s life is a confluence of all that has happened, is happening, and will happen. The novel is also about the unceasing little tragedies that make up our lives – melancholy is the generally prevailing norm in everyone’s life. A gentle reminder that while we may all be happy (briefly) in our different ways, when it comes to gloom there isn't much to distinguish between yours and mine. 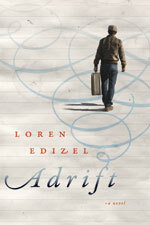 Adrift is one of the best novels I’ve read in 2011.